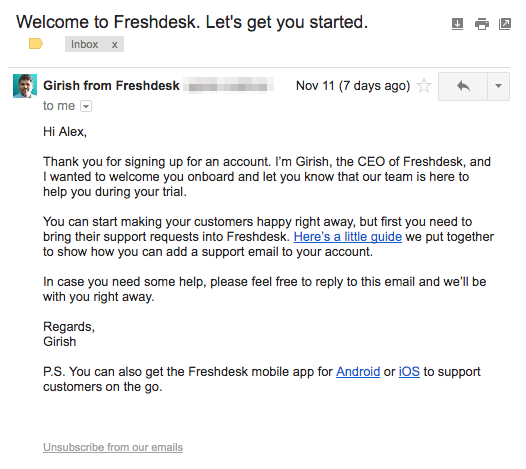 Founders of large companies don’t normally send welcome mails to new users. And if they do, they certainly don’t reply to responses to these emails. Except that Girish Mathrubootham, founder of Freshdesk, seems to have done both with a customer. Alex JV, the founder of HighlyReco, was surprised when he received an email from “Girish from Freshdesk” after he’d signed up for Freshdesk. “When you sign up for a service, you generally get a signup welcome mail. It is always an automated email and usually it is sent from a [email protected] address,” he writes in a Medium post. But the mail from Freshdesk seemed to be from the CEO himself. Alex says he was curious to know if Mathrubootham was actually behind the email. 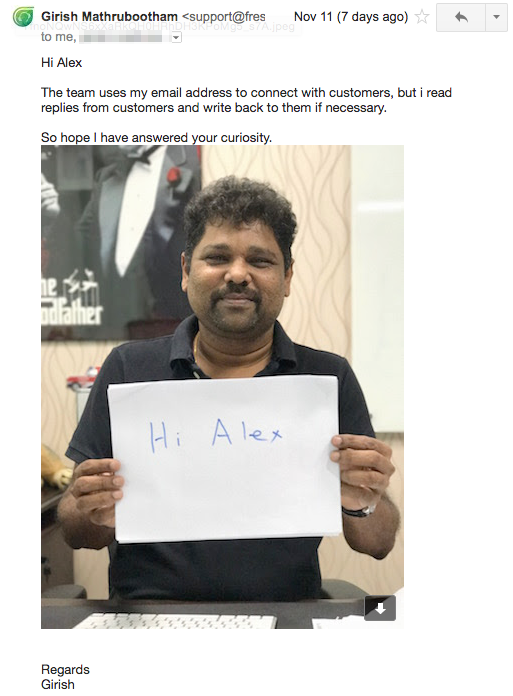 Freshdesk has over 80,000 customers, and it seemed unlikely that the CEO himself was going to look at mails addressed to him. He replied to the email, wondering if Mathrubootham would reply. “I realized what it means to really care about the product that you build,” Alex writes. Freshdesk isn’t a small startup any more – it’s raised over Rs. 1000 crore, and has 800 employees globally. But the CEO seems to still message all his customers, and even replies with cute photos. Maybe it’s customer-centricity like this that’s made it one of the most successful SaaS startups from India.